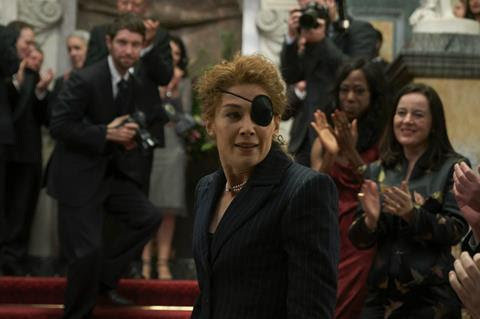 The life and death of Sunday Times war correspondent Marie Colvin. Nimbly edited and directed with brio, this portrait of the legendary Sunday Times war correspondent Marie Colvin represents a sure-footed leap for director Matthew Heineman from documentary to factually-based drama. Rosamund Pike gives a wholly committed performance which captures Colvin’s mannerisms – the cigarette-ash croak of a voice, the deliberate diction, the hunched posture – and gives a sense of the emotional war wounds accumulated from several decades reporting from the frontlines. There are a few clumsy moments, but for the most part, this is a serious-minded and unsensational study of an extraordinary journalist who sacrificed everything in the line of duty. With his previous films Cartel Land and City Of Ghosts, Heineman demonstrated the same qualities which are evident here: an instinct for storytelling and an empathy for those who struggle to make their voices heard. They are qualities that he shares with the late Colvin, who famously didn’t care so much about what kind of tank was advancing but would stride in front of it if it meant she could tell the story of one of the ordinary people whose lives it had destroyed. Heineman, clearly, is a good fit for the material, and brings a jangling tension to the nerve shredding combat sequences. What’s less successful is a screenplay which feels a little overstuffed, as if it is trying to cram in too much of this extraordinary life. Aviron Pictures has acquired the film for the US and will release in November. The screenplay took as a jumping off point Marie Brenner’s 2012 Vanity Fair article ‘Marie Colvin’s Private War’; within it, Colvin’s life is divided into chapters counting down to her final assignment, in the besieged Syrian city of Homs. This gives the film an episodic structure, but in this case, it chimes with the war correspondent’s reality of bursts of unimaginable stress interspersed with down time. The mental scars take longer to fade after each trip, however, and Marie suffers from flashbacks and nightmares. The editing is particularly effective in conveying this – snapshots of horror embed the film like shrapnel; doors in London open into memories of Libya, of Sri Lanka. Ultimately she ends up in a hospital where, in one of the clumsier scenes, she delivers her own backstory in a contextualising monologue. Shoulder to shoulder with Colvin is her friend and photographer Paul Conroy (played here by 50 Shades’ Jamie Dornan), who matches her cigarette for cigarette, vodka for vodka, bullet for dodged bullet. The dry wisecracks batted between the pair will ring true to anyone who watched the recent documentary about their ill-fated final assignment, Under The Wire. A closing title song by Annie Lennox brings an unexpected jolt of sentimentality which is not present elsewhere: this is a film which is direct and unflinching in what it shows, but attempts to avoid manipulation. What remains to be seen is to what extent the audience is prepared submit itself to material as bleak as this. Filed under Arts & Culture, Biography.